Okay, here we go: no ‘best of list’ but a completely subjective round-up of the comics I enjoyed most in 2013. Of course, I’ve not read every comic produced in 2013- March, The Encyclopedia of Early Earth and Boxers and Saints being some notable books I’ve yet to get round to, but then who has? I’ve reviewed quite a few of these books and talked about them in other pieces and places, so apologies if some of this sounds familiar. Where I have reviewed something, I’ve linked to it via the title- just click to read more about it if interested. 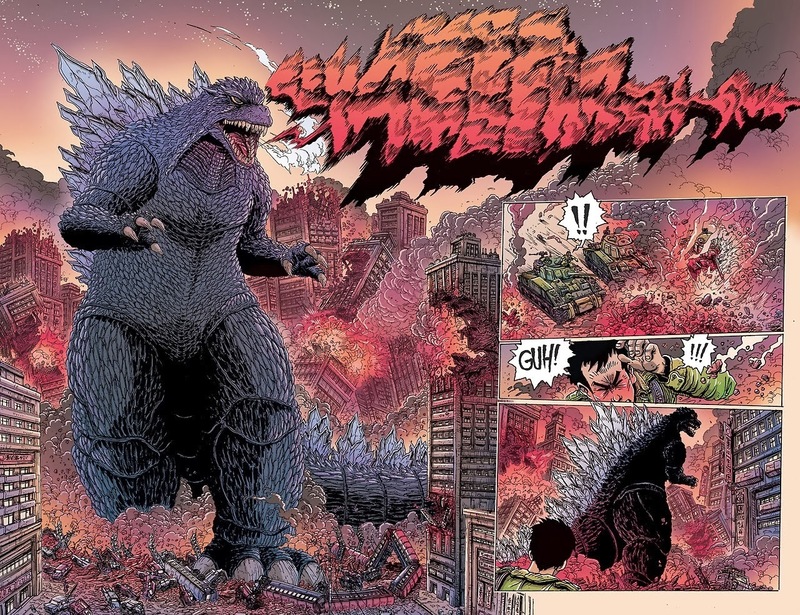 Can we start with James Stokoe’s Godzilla? I don’t issue read, so I picked this up when the trade came out in July after months of both hearing buzz and simultaneously trying to avoid it, in an attempt to retain as much of the experience for that first encounter. The danger with hyped books is heightened expectations and the worry of being let down, but Godzilla is bloody amazing. I’d never read a Stokoe book before, apart from the odd short comic here and there (first issue of Orc Stain, the Silver Surfer story for Strange Tales), and the full brilliance of his hyper detailed, gradient happy art is on display on every page here. Half Century War spans over 50 years, tracing Godzilla’s first appearance through to a world reduced to a passive audience as monsters battle around them. I can quite clearly recall my excitement when Stephen Collins The Gigantic Beard that was Evil came through the post last summer. Collins, a cartoonist for The Guardian, produced an immensely assured debut, experimenting with panels, compositon and layouts, and combining wit, brevity, whimsy and metaphor. The tale of a spotless, tidy and clean-shaven utopia, in which one man suddenly sprouts a huge, uncontrollable, constantly growing beard, it bought to mind Roald Dahl and Raymond Briggs. I started work in a comic book store last year and it also demonstrated how effective a good title can be- people would look at it, read it and buy it on the strength of that alone. It’s easy to forget about anthologies in these sort of lists, sometimes, as they’re not tied to one specific person. The Nobrow anthology can generally be relied upon to gather quality artists for some cool comics and gorgeous spreads, but volume 8, Hysteria, excelled itself- there were great comics from Zack Soto, Dustin Harbin, Dilraj Mann and illustrations from Sam Bosma, Rebecca Dart and a whole load more. They can be a bit hit and miss, but the last two volumes have been superb and are well worth picking up. Along with kus komiks s!, Nobrow’s anthology is currently the best showcase for a taste of what comics can encompass, providing an entry-point into a smorgasbord of styles and approaches and always a good way to make yourself familiar with new creators. Another anthology that stood out in 2013 was Tiny Pencil, a new all-graphite art and comics compilation, edited by Katriona Chapman and Amber Hsu. The first volume of Tiny Pencil debuted at a time when everything I was reading wasn’t bad, but getting a bit samey- and then Tiny Pencil came along and it just felt completly fresh- free of artifice and encumberment, with stunning pencilled visuals. Hsu and Chapman were unafraid to experiment too, following up that first volume with a special summer edition: 3 mini zines in a exquisitely designed box, complete with dice and colouring pencils, with the third returning to the more traditional A4 format. The debut and subsequent books are all the more impressive when you think of how formed the identity and concept of Tiny Pencil feels in such a short space of time. Very much looking forward to what they come up with this year. I’d be interested to read how many of the books featured on ‘best of’ lists are released in the second half of the year. That said, I don’t remember reading much at all on Graham Chaffee’s Good Dog. Released in April from Fantagraphics, it’s a beautifully understated treatise on belonging and finding your place. It can be difficult to find nuance in animal stand-in tale, with people often going cutesy or the acute opposite, but Chaffee manages to find a line that’s at once human and animalistic, producing the most real book I read all year. 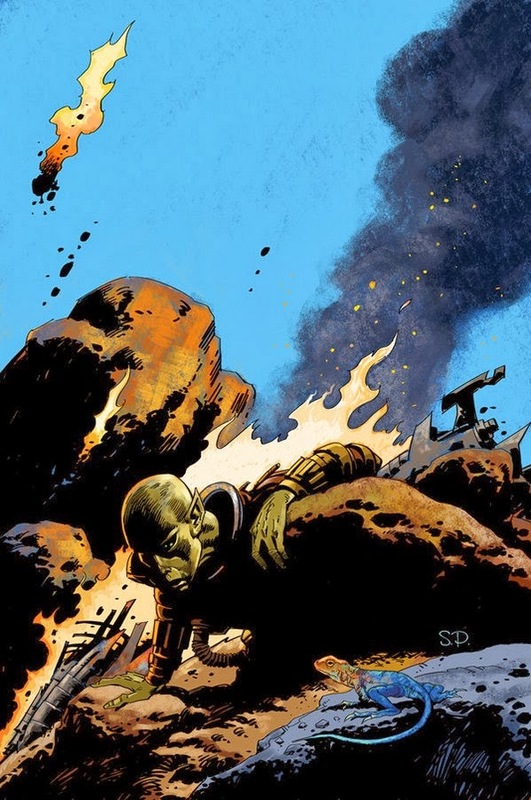 Another trade collection that came out in early 2013 was Steve Parkhouse and Pete Hogan’s Resident Alien from Dark Horse. I can’t quite articulate how much I loved this: an unshowy, solid story of an alien disguised as a human, living peacefully on Earth after his ship crashes, and forced out of his quiet existence on the outskirts of a small town when a murder takes place. Simply very fine storytelling. I’m so glad they’re doing another series. MIND MGMT by Matt Kindt was the second Dark Horse collection that took me completely by surprise. A tale of espionage, government conspiracies, and paranormal abilities, it shared a few thematic similarities with another Kindt book that also makes my list: Red Handed from First Second. The latter is seated more in the crime genre- an epic this how it was pulled off tale, but the twisty turny narrative strands, the various narrators who you may or not be able to trust were again present, with Kindt’s watercolours a perfect foil to his unreliable tales of forgetting and re-writing. My knowledge of Singaporean comics is very thin, so when Singaporean publishers Epigram Books announced a comics line to be released in English, it was a very appealing entry-point. The roster was great, but the 2 books that stood out were editorial cartoonist and journalist Miel’s Scenegapore, a succinct, informative, and humorous sojourn through the country’s history and landscape and Drewscape’s (aka Andrew Tan) Monsters, Miracles and Mayonnaise, a collection of his comics work over the years, from autobiographical strips to sci-fi and fantasy work. It was incredibly pleasing to see Tan’s talents recognised by an Eisner nomination. Monster on the Hill by Rob Harrell was a fantastic all-ages story from Top Shelf. I hate reading comics on a screen, particularly those that aren’t created specifically for the platform, i.e. review copies for print books, so taking that into account, I was about halfway through a PDF of Rob Harrells’ debut before I noticed I was smiling like an idiot and had been doing since the opening pages. Fun, silly, heartfelt, and serious, with Harrell’s wonderful cartooning bringing it all together. If you’re looking for a great kid’s comic, it doesn’t get much better than this. It seems every ‘best of’ roundup or list featured a Sam Alden comic, and I’m afraid this one is no different. There were a few to choose from- Household, Hawaii 1999, The Worm Troll, Patron Saint, but the one that resonated with me was the pencilled Backyard, in which a group of housemates carry on uninterestedly while one of them regresses to a disturbing degree. It’s difficult for me to comprehend that a Chrsitophe Blain book went under-apreciated, but that’s what happened with In the Kitchen with Alain Passard. 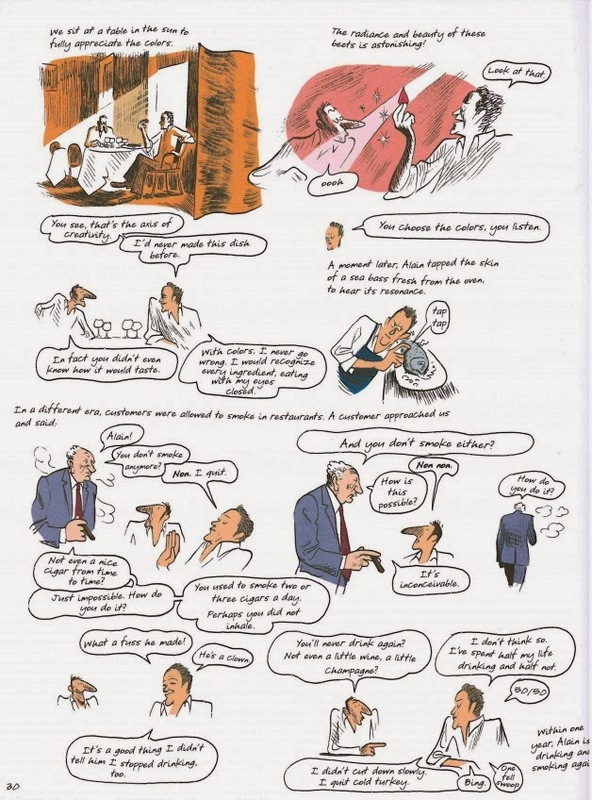 Not sure whether that was comic-book-released-by-large-book-publisher syndrome, but Blain’s docu-comic/interview with the thrice starred Michelin chef was accessible, entertaining and visually interesting: border-less, white backgrounds and more text bubbles then you could shake a stick at, as well as the inclusion of 15 recipes. The dialogue between Blain and Passard is lovely, too- witty, engaging, indicative of each’s character. Something which was tonally very similar to In the Kitchen was Etienne Davodeau’s The Initiates, where Davodeau and his vintner friend swap places, with each learning abut the other’s profession. There’s a highlight of a cameo page in there by Lewis Trondheim, who steps in to explain things when Richard questions why he draws himself as a bird. I didn’t get around to picking up Greg Ruth’s solo effort,The Lost Boy, but I did buy his collaboration with Steve Niles, Freaks of the Heartland. It’s a perfect example of the unique kind of magic that comics can weave; Nile’s story of a small town birthing monstrously misshapen children and locking them away is simple enough, but it’s Ruth’s sumptuous, evocative art that elevates it, imbues it with nuance and emotion and remains with you after it’s all over. Laura Park’s mini-comic with Uncivilised Books, Do Not Disturb My Waking Dream, debuted at Autoptic, and was available to purchase online shortly afterwards. Parks uses the format fully, giving the reader scenic full page spreads in one instance and then placing a 9-panel grid in the centre of the next. 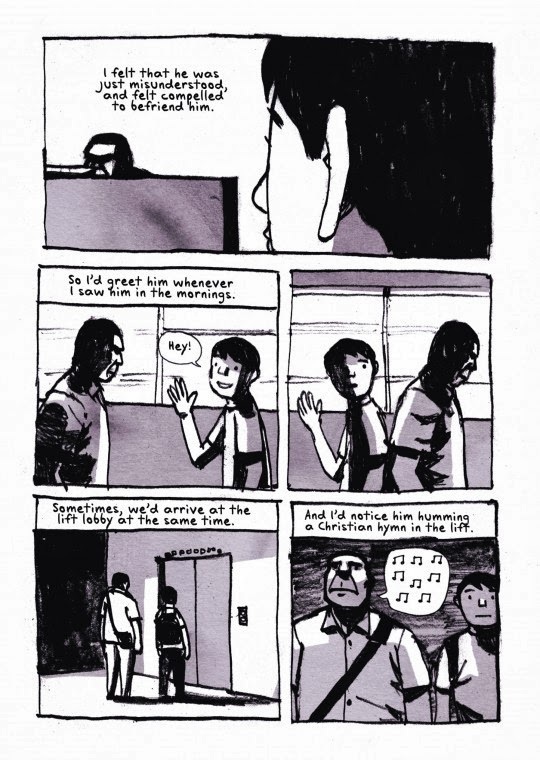 Her autobiographical strips and observations are funny and honest and make for a very satisfying slice of comicking. 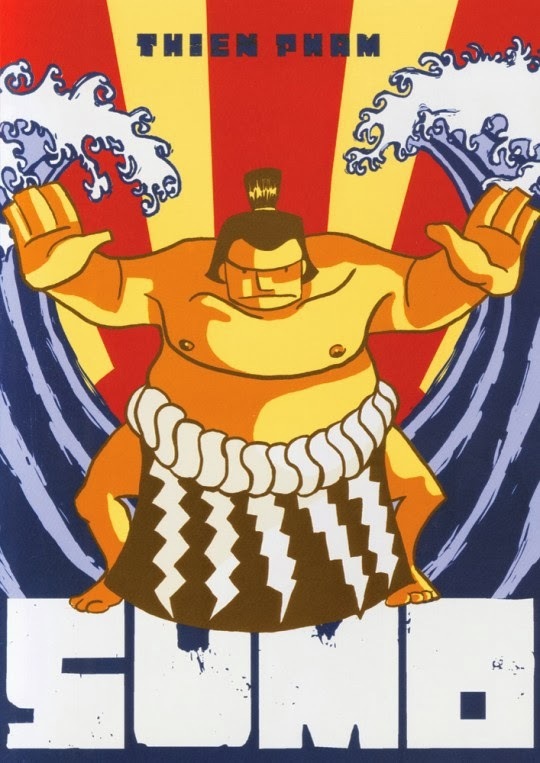 Thien Pham’s Sumo, in which a college football player decides to travel to Japan to become a sumo wrestler after his plans fall through, has a lovely pared back approach with beautiful clean art- it didn’t get much attention and it deserved some. It’s not an obvious, flashy book, and sure, it’s a familiar plotline but Pham infuses it with his own perspective, avoiding cliche. Anyone who’s read some of my writing knows I’m the driver of the Julia Gfrorer bandwagon. Her Black is the Colour, originally serialised on Study Group Comics, was released from Fantagraphics, with a lovely thick, grainy cover and paper. Featuring Gfroer’s signature mix of mythic, supernatural elements to throw into relief the very human facets of her characters, it’s also one of the finest mermaid iterations you’ll read. Darwyn Cooke’s Parker: Slayground released in the tail-end of 2013, as is becoming tradition and for me, it was an improvement on the last, which was a busier affair. Slayground is a tighter, leaner affair, with anti-hero thief Parker operating alone once more, with Cook’s art fitting the retro- gangster tale like a glove. And it also had a nice fold-out spread; a map of the theme park Parker finds himself trapped in. I like those kind of little additions. Drowntown by Robbie Morrison and Jim Murray ticked all my boxes: sci-fi, crime, anthropomorphic characters, oddball PI’S, but at the rate it was selling at the shop, that wasn’t a completely subjective preference. 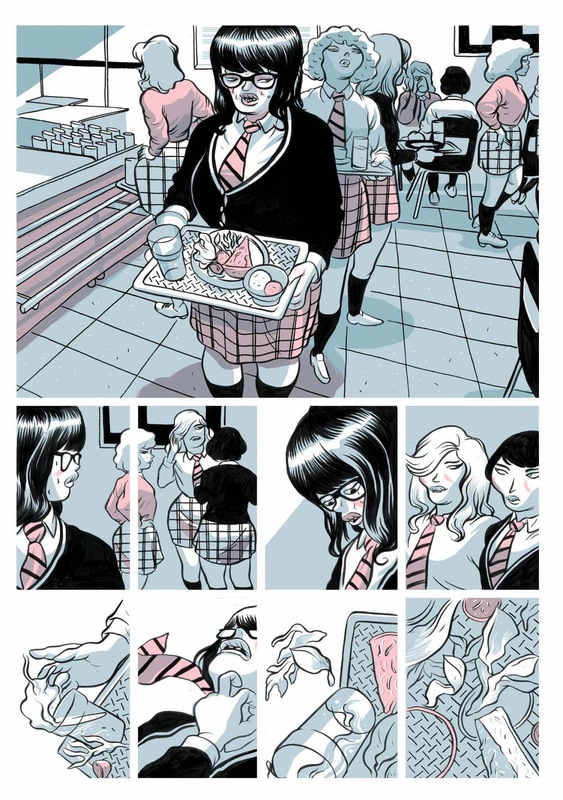 Jim Murrays’ art is astonishing here, really bold and hulking with character and personality (seriously, click on that image to see it bigger). 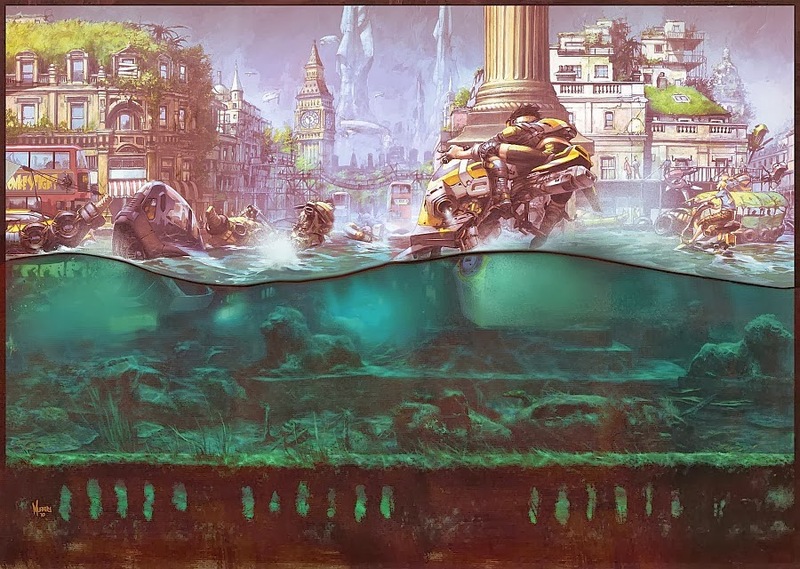 Set in a flooded London of the future, with the big money in animal-human hybrid experiments and DNA science, it’s an intriguing mystery- the first part of 3 books, but appreciable on its own. I managed to squeeze in Thomas Wellmann’s first major English language work, Pimo and Rex, in before writing this, after finally getting my hands on a copy at Thought Bubble. German publishers Rotopol Press teamed up with Blank Slate Books to give this a simultaneous German and English release (I don’t know the logistics of that, but it’d be cool to see more people try it), and it contains some of the most wonderfully coloured art I’ve seen in comics all year. It’s a zany adventure very much in the Trondheim tradition, but just click through that link to see Wellmann’s cartooning- you won’t regret it. 2013 was the year I discovered Swedish comics publishing outfit, Peow! Studio. 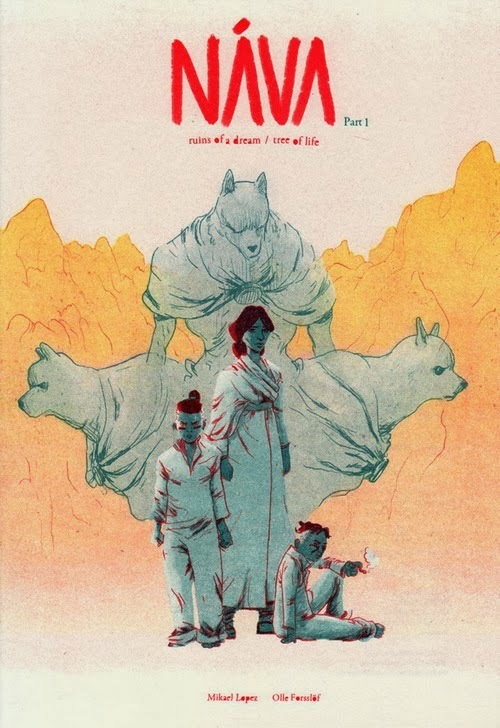 Run by 3 talented artists and comics creators, all their publications are worth a look-see, though my favourite thing that they released was Nava, a beautifully understated tale combining myth and fantasy, drawn to sublime effect by Olle Forsloff. The most impressive thing about Nava was the various beats and tones that Lopez and Forsloff managed to achieve- the seamless transition from one act to another- meditative to adventurous. Very much looking forward to that second instalment. A self-published work that I loved was Isaac Lenkiewicz’s Dead Cats of Plum Street. Everything about Plum Street was simply on-point- the fine-lined brush work, the cartooning, the coolest 3 girls you’ll meet. Lenkiewicz mixes together a bit of silliness and witchiness, whilst giving his story serious attention and it works. This was without doubt one of the best things I read all year. Ines Estrada’s mini kus, Borrowed Tails, was a fab showcase of her work. Her colouring always stands out to me- mainly because I’ve not seen anyone else achieve the effects she does with her watercolours, but she’s a fantastic cartoonist all round. You can easily tell the standout web-comics by the rapidness with which they’re shared via social media: the ever-brilliant Emily Carroll’ deliver another interactive horror masterpiece with Out of Skin seemingly the only thing people talked about for a week in my Twitter and Tumblr feeds. The same thing happened with Pat Grant’s Tooriyama, a superb comic which recounted his relationship with his father from childhood to adulthood. Boulet was again king, with animated comics, endlessly scrolling comics, pirate stories, fairy tales, travel diaries, fine art mixed with photos- anything you could think of, he did. 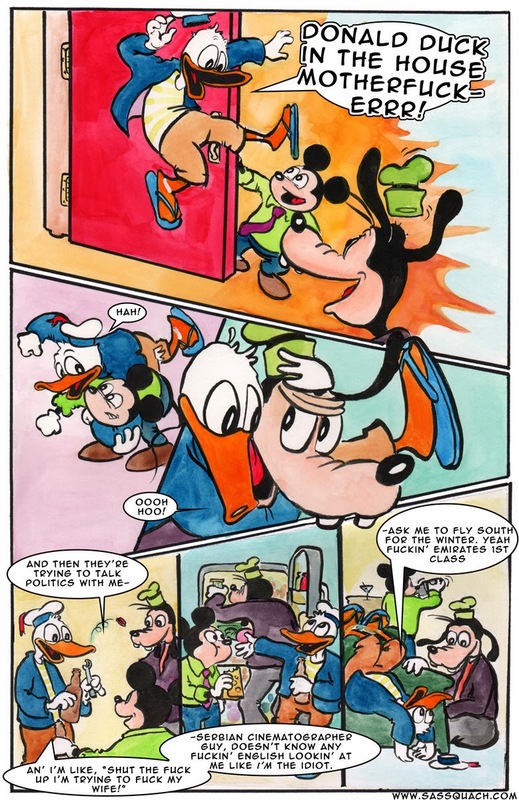 And I’m going to finish with AP Quach’s and Max Landis’ comic, Boy’s Night, which sees a middle-aged Mickey, Pluto and Donald go clubbing and meditate on the course of their lives. Amusing, melancholy, and yet weirdly affirming. Here’s to another year of the crazy world of comics.